With Canada's Anti-Spam Legislation coming into force on July 1, businesses will want to know the implications of the new laws, inside and out. Here's a playbook for marketers trying to get ready to change how they interact with their customers. With the enactment of Canada’s Anti-Spam Legislation (CASL) around the corner, it’s hard to know what kind of message your business is allowed to send to reach customers, and what kind of message is taboo – especially with the threat of a sizeable fine. Penalties for non-compliance can reach up to $1 million for individuals, and $10 million for businesses, with statutory damages of up to $200 for each violation of the prohibition. Just one email or text can count as a violation. So with those stakes on the table, how do you ensure you mitigate your risk and comply with CASL? On Sept. 29, Toronto lawyers Adam Kardash and Joanna Fine held a workshop for 60 attendees from organizations from all over Toronto, explaining who the laws will apply to, and what kind of messages will fall under its scope. Kardash and Fine, who specialize in privacy and information management at Heenan Blaikie LLP, supplied us with more details on CASL, unpacking what it means for businesses. What kinds of organizations does CASL apply to? 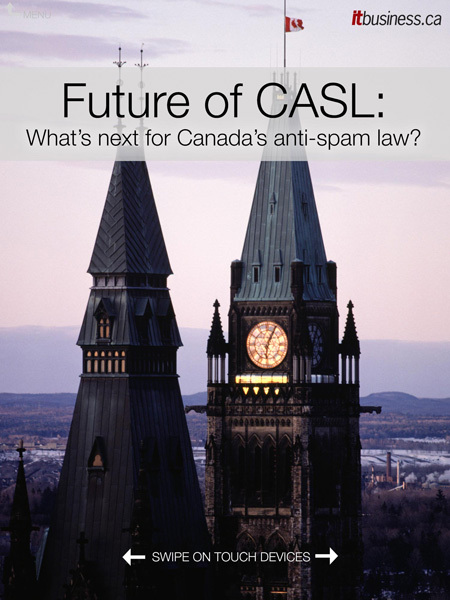 “CASL isn’t meant to stop legitimate business activity. It’s meant to stop rogue spammers,” Kardash said during his presentation. He said CASL will apply to any organization sending commercial electronic messages, focusing on cutting down on spam and preventing Canadians from getting unwanted texts and emails landing in their inboxes. However, there are exceptions to the rule. During the workshop, one attendee asked whether CASL targets foreign spammers. What kinds of messages does CASL apply to? CASL isn’t limited to just emails or texts, Kardash said. It can apply to any commercial electronic message sent through any means of telecommunication, including sound and voice messages. It also includes emerging forms of electronic messaging, meaning in the future, something built “by a guy in his garage” could still be covered under the law. Basically, any form of electronic messaging that encourages the recipient to participate in a commercial activity falls under CASL, Kardash said. So how can businesses contact customers? When CASL comes into force, there will still be some exceptions for Canadian businesses. While the rules are very clear about whether businesses can send messages to consumers, those rules are waived when consumers give express or implied consent to receive them. Express consent can be either in verbal or written form, but it has to be an action on the consumer’s part. They need to know what the consent is for, and they have to be provided with the sender’s contact information. They also need a statement indicating they’re allowed to withdraw their consent at any time. Given the benchmark for express consent is a high one, prechecking boxes saying “I want to receive information about the sender’s offers” doesn’t truly count as consent, Kardash said. However, obtaining implied consent is a little easier. This happens when two parties already have an existing business relationship. For example, if a recipient has purchased goods or services, or signed a contract with a business, they’ve given their consent to be in contact with that business. Yet this form of consent is time-sensitive, only counting for two years after a purchase has been made or two years after a contract has expired. If a customer has submitted an inquiry or application, the implied consent is only valid for six months, Fine said. Beyond consent, are there any other opportunities for businesses to send messages to customers? Businesses still get the green light to send messages that answer customer queries, or that provide quotes or estimates. Those kinds of messages are also OK under CASL when they simply confirm a commercial transaction, Fine said. However, the messages still have to comply with CASL’s consent and unsubscribe requirements, giving recipients a way to say they no longer want to receive those kinds of messages. What’s also unclear is how CASL will handle cases of businesses running contests. Fine suggested those may be considered as implied consent, with contest entrants agreeing to receive messages from a business for up to two years after the business names a winner. Still, legislators may need to clarify how that will work by the time CASL rolls around next year. Bret Conkin is the chief marketing officer for FundRazr, Canada’s biggest crowdfunding platform. 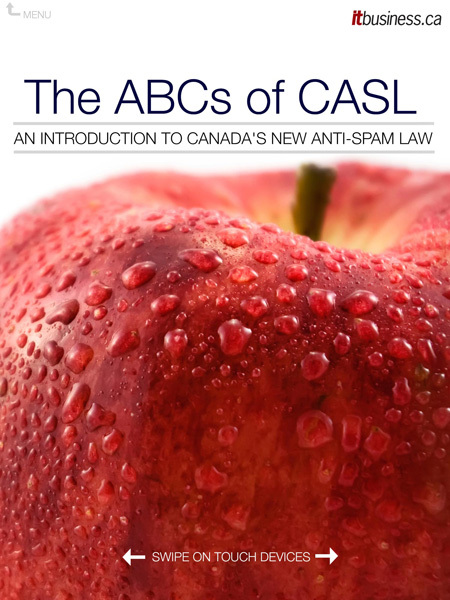 He has prepared this list of tips for marketers, in advance of Canada’s Anti-Spam Legislation (CASL). This post appeared as part of our Twitter chat on Sept. 23, held at the hashtag #beCASLReady. Check out his post below for his tips! If you send email from or to Canada, then you need to know about Canada’s Anti-Spam Legislation (CASL) so you can start preparing now. Here is a guide with some examples of the marketing impact of the new legislation on our business FundRazr. There is still some grey in some of the provisions, so stay tuned. As background, FundRazr is Canada’s largest crowdfunding platform. We send email to over 20 countries including Canada, from Canada. We have 70,000 social media followers and we send a large amount of email and other commercial electronic communications like Facebook notifications. What is the goal of CASL? What are the most crucial parts of CASL that businesses need to know about and comply with? 1) Check your Consent. 2) Fix your Content. 3) Start Now. 4) Fewer headaches later. The sooner you adjust the less cleanup once CASL hits. • Need permission before sending email. • Need to be able to prove the permission with clear consent. • No false or misleading subject lines or from names. Clearly define the sender. • No pre-checked boxes on forms. Consent needs to be an affirmative action. • Unsubscribe features must work and take place within 10 days. A valid unsubscribe link must work for 60 days after the send date. • No sending an “Are you sure you want to unsubscribe?” email to confirm unsubscribes. • Must include a valid postal mailing address and either: web address with contact form, email address or phone number. • Both organizations must be disclosed if you are sending “on behalf of” another organization. • Charities are included if they are selling or soliciting (e.g. donations). One issue we’ve considered at FundRazr is around No-Reply emails like the Reply-To: The FundRazr Team no-reply@fundrazr.com used for this newsletter. Under CASL, disclosing the sender and making contact easy is prescribed. Like other businesses, we’ve used them in the past to avoid out-of-office replies flooding our inbox. We’ve decided to move away from this practice as the benefits of cleansing our list and making it easier for customers to talk to us far outweigh the drawbacks. See more at Elite Email Inc.’s blog post. What are the biggest implications of CASL for businesses? CASL changes the way we get permission and how we communicate online with severe repercussions for non-compliance. Records of clear consent need to be kept and date stamped. Partner programs are an example of an area where CASL has an impact. We offer a Crowdfunding as a Service solution for other businesses wishing to offer crowdfunding to their customers who need funding, called Powered by FundRazr. All on-behalf electronic communications related to this plug-in offering will need to disclose both organizations, e.g. FundRazr and Collegiate Club Sports. Another example is keeping business cards that prove the recipient shared their address with you (and did not specifically ask not to be sent emails.) Or better yet, using Card Munch or customer relationship management software – FundRazr uses Highrise – to date stamp the contact. Businesses with an offline component like a storefront, tradeshows, or events need to find ways to keep records of consent when they gather emails without a business relationship – like a purchase or contract – in place. What can businesses do to prepare for CASL? At FundRazr, we have started to segment all databases by their consent level and exact timing. Prior to the legislation we classified the databases by month, which would be risky going forward. Determine where consent obtained is expressed and where it may be implied (e.g. current business or non-business relationships). c. Employees of organizations or other organizations where business relationship exists. f. Transactional emails (without marketing language). For example managing two-year and six month time limits under CASL for implied consents, unless upgraded to express consent, with “stop send” dates in system. At FundRazr, we cleanse our lists quarterly, do not mail to customers more than 12 months old and try and ensure express consent as much as possible. This must be functional for at least 60 days, no cost to recipient, should use the same means as original CEM, includes either an electronic address or a link to which the unsubscribe may be sent, and is processed without delay and within 10 business days. At FundRazr, we clean our lists of unsubscribes weekly and meet the other requirements, so this has not had a real impact. Review communications. Check the function of your messages and where they’re sent. It’s also important to determine what is caught by CASL and the requirements for compliance. Here’s an additional resource from Davis LLP. How can businesses maintain relationships with customers and start new ones with CASL coming into force? What kinds of third-party services can companies turn to? FundRazr uses Mailchimp and SendGrid, Mailchimp for campaigns and SendGrid for transactional emails. Mailchimp provides a great resource on anti-spam compliance here. Elite Email also seems to be providing very good insights into CASL on its blog. In other words, these services can help guide you as they help manage compliance on a by-market basis. Other benefits include deliverability and accessing the latest technology. When sending emails without third-party providers, ensure all aspects of CASL are followed. Further, the social media platforms also provide regulatory compliance assistance for marketers using features like Facebook authentication. These platforms build in explicit consent mechanisms and can be very useful options for online businesses. Currently all FundRazr campaign creators must authenticate with Facebook or Google + which helps ensure explicit consent. What are some good strategies to elicit consent from customers, in light of CASL? Clear Terms of Service. Double opt-in. No pre-selected boxes on forms. Clear language. Understanding database management requirements. What kinds of penalties can businesses expect for flouting CASL? Maximum penalty for a violation is $1 million for an individual and $10 million for a business. Directors and officers can be personally liable. See more at this blog post from Davis LLP. Can you share any tips for small businesses that need to be mindful of CASL? a. Text, social media notifications and messages, instant messaging and “computer programs” are now covered. CAN-SPAM only covered email and since FundRazr is a platform and social media application, we needed to review additional messaging to ensure compliance. The specific provision about express consent for software applications can be found here. 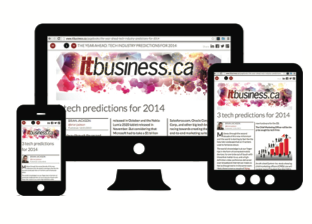 So, check out the resources included here and on ITBusiness.ca and continue to do your homework. That way, your small business will be ready for all of the changes with CASL – and you’ll be ahead of the curve. Canadian marketing company Elite Email Inc. has released a new mobile tool that aims to help businesses build a customer base – and keep it – as Canada’s anti-spam laws loom ahead. Elite Email, which is celebrating its 10th anniversary on July 3, announced it launched Elite Mobile Marketing on July 2. The tool prompts customers to text a keyword to a number like 555444 in return for a coupon code or promotional discount. It then adds customers to an emailing list, and it can also send them notifications and updates via their smartphones. “We want to let our customers do a little more and capitalize on the fact that everybody now has a mobile device,” says Robert Burko, CEO and founder of Elite Email, adding that clothing brands, restaurants, and other clients can use the tool for quick promotions. For example, if a restaurant wants to advertise happy hour drink specials, it can send texts to all the customers on its list. And while QR codes fulfil a similar function, Burko says older people don’t always want to use QR codes since they are unfamiliar and unwieldy, especially since users need to download an app to scan the codes themselves. So far, a few of Elite Email’s clients have used the mobile marketing tool as a demo during warehouse sales. For example, at a Lacoste and Esprit sale in Toronto in May, there were signs everywhere on the sales floor telling customers to text a number for the chance to win a pair of shoes. And while that was handy in getting customers excited about deals, the real gem in using text-based marketing was the ability to remarket to those customers. By entering the contest, customers agreed to be added to a mailing list to receive more offers and advertisements. Only 0.38 per cent of customers opted out of the mailing list after the warehouse sale was over. Among mobile users, 0.15 per cent asked the company to stop sending them text messages. The game plan in getting customers to agree to keep receiving marketing missives? Solid, interesting content that provides value to the customers as well as the company sending the messages, Burko says. Following up on the Lacoste and Esprit sale, Elite Email sent out messages alerting customers to similar sales happening in the Greater Toronto Area. “The key is, follow-up content has to be good. We always say, the right message, the right person, the right time … If you send out good content at the proper frequency, people are going to open your emails, they’re going to engage with your mobile campaign, and they really like it,” he says. The other important piece of sending these emails is that customers have consented to receiving them. Getting consent ensures companies are complying with Canada’s Anti-Spam Legislation (CASL), which has passed through Parliament and has received Royal Assent. It will be coming into force July 1. When CASL finally does launch, Burko says he expects companies will have to be even choosier about how they leverage email marketing. Elite Email hasn’t released a price for its mobile tool yet, but its emailing tool starts at around $15 a month, although that increases as the mailing list gets bigger, Burko says. Align your brand with leading journalistic reviews on topics of your choice. Demonstrate your company’s expertise. Build awareness and leads. Formatted much like a digital magazine and viewable on any device, Page Books provide you with the perfect opportunity to profile your brand and/or your expertise together with a collection of syndicated content sourced from IT World Canada media properties.